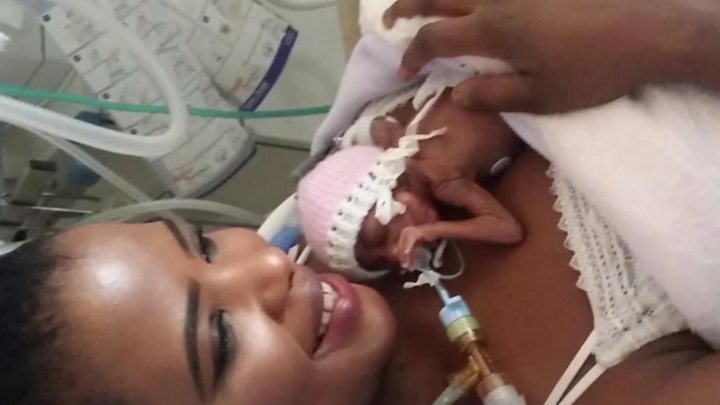 Image caption Aga Phiri says hospitals in Malawi are "very bad"
Ms Phiri, 33, said going back to Malawi would put her and her daughter's lives at risk. "Hospitals are very bad in Malawi. They don't have drugs, you wouldn't even find paracetamol there," she said. "People die of minor things." "I escaped it but my mum and sister had it," Ms Phiri added. "It is so dangerous, I need to protect my daughter from it. "I feel cursed after all the trauma of Elizabeth's birth and now this." Oldham West and Royton MP Mr McMahon said: "Elizabeth was born prematurely and still needs care from the NHS to help her survive. "We should not be throwing vulnerable people who need us back into situations where they will come to harm." The Home Office said: "All asylum claims are considered carefully and sensitively based on the evidence provided and published country information, which covers country specific issues."